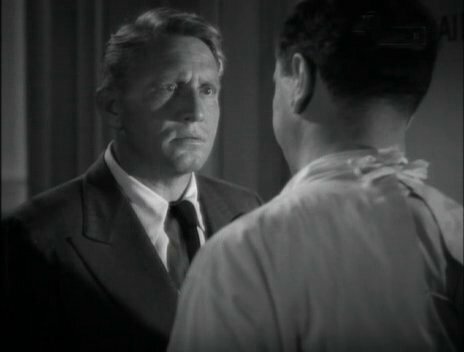 Cass Timberlane is an awful film from the very beginning when we first encounter Spencer Tracy camped out on the bench as the Circuit Judge of Backwoods, Minnesota where he delivers a smug sermon to a couple seeking a divorce about the sanctity of marriage. Easy for him to say, what with his old lady dying in the first year of their marriage. I will confess that I gave Judge Cass some credit when he thought to himself about how boring it was to be sitting there listening to all these boring cases. But then again, it wasn’t like he had to sit through a movie about it, either. In fact, if it wasn’t for the precious cat that sneaked into his courtroom and caused him to sneeze, I dare say that old Cass would have probably slipped into a coma by the time the routine slip and fall case came up on the docket. 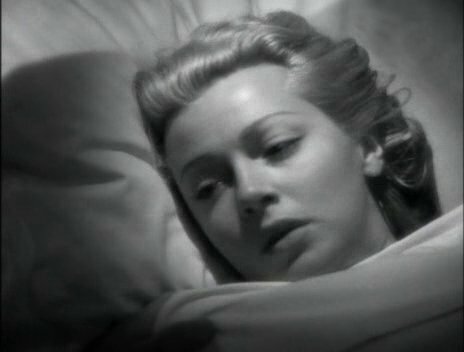 As it was, he wasn’t exactly sitting in rapt attention – at least that is until a witness for the victim appeared and looked incredibly like 1940s blonde bombshell Lana Turner. Her name is Virginia Marshland and she’s an artist staying at the boarding house of the victim and the judge takes an immediate interest in her testimony. But surely, this relationship couldn’t go any further than the deluded thoughts of a lonely, dirty old man what with her being the star witness in a case he’s hearing, right? The movie then painfully details their burgeoning relationship by showing them down at the river having a picnic and engaging in cloyingly cutesy dialogue and Spencer just embarrasses the hell out of himself when he’s trying to read her some poetry and show his affection for her. He even started tickling her at one point. Crud, that guy was old enough to be her dad! Once he finally introduces her to the country club set, almost all of them immediately hate her. 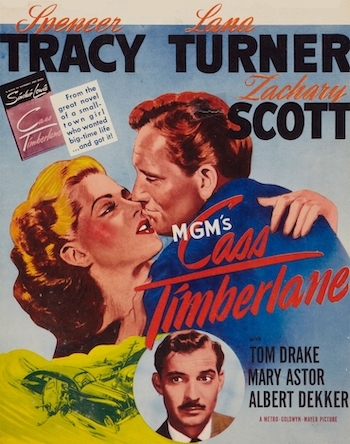 Despite his friends’s snarky backstabbing remarks, Cass goes ahead and marries Ginny (as he has so unfortunately come to call her – she announces at one point that she’s going to call him Timber, but actually refers to him as Tim for the rest of the movie). She struggles to fit in with his crowd for about a week and then Cass starts to hear rumors that she wants to leave Grand Republic, MN to go to the big city where it’s really exciting and there’s no such thing as uppity snobs. Before he has to deal with that though, Ginny announces that she’s pregnant, prompting everyone in the audience to fill out their dead pools as to precisely how she’ll lose the baby. Roll down the stairs? Horse riding accident? Domestic abuse at the hands of Cass’ sleazy best friend Bradd (Zachary Scott) with whom she’s going to be leaving Cass for later on in the movie? Following that, Cass tries to teach Ginny how to play chess at his cabin retreat. Sleazy best friend Bradd is hanging around teaching her how to fly airplanes and co-starring in a romantic play with her. And Cass is trying to explain to her why a queen can’t jump over other pieces? Gawd, old timer! Why don’t you just unsnap her bra for sleazy best friend Bradd and loan him a condom? In Cass’ defense, he does confront sleazy best friend Bradd and tells him to keep his tan, mustached face out of his wife’s bloomers. But then he goes ahead and believes it when sleazy best friend Bradd promises that he won’t mess with her. It doesn’t matter though because Bradd is taking a lawyering job in New York. But then Cass takes Ginny to New York to see about a lawyering job for himself! This guy’s subconscious efforts to sabotage his own marriage aren’t really all that subconscious are they? Guess what happens in New York? Sheer disinterest prevents me from recounting it all in dull detail, but suffice it to say that Ginny ends up swimming in a gutter. Believe it or not, there was more soap opera silliness to come involving Ginny lying on her death bed and being given the will to live again once Cass appeared at her bedside. Somehow it all gets wrapped up so that everyone lives happily ever after, but why do I even care? Ginny turns out to be everything that the snobs said she was: a social climber interested purely in status. That’s why she wanted to stay in New York. It was fun, full of parties, famous people, and stores that sold fancy hats. And Cass was such an off-putting self-important prig (he played the flute for crying out loud!) that you didn’t feel too bad for all the problems his little bombshell was causing him. Hey, you want it easy? Marry an ugly broad! Based on a novel by Sinclair Lewis, you have to wonder if the good stuff was cut out, especially considering that he also penned the novel that the much more ambitious and successful Elmer Gantry was based on. This is the kind of movie that just goes to show that even the biggest stars can’t rescue middling material, especially when those stars don’t exactly produce sparks together. 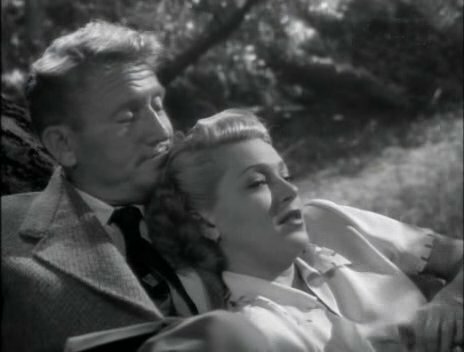 Creepy old judge lusting after young blonde hussy witness just wasn’t what anyone wanted to see out of Spencer Tracy. I think everyone involved realized this because his next picture saw him back with frequent co-star Katharine Hepburn in State Of The Union, while Lana was back romancing the more suitable Clark Gable in Homecoming.